These Fair Trade mattress pads are 100% organic cotton, inside and out, and set the perfect foundation for your organic bed. Finished with two-inch quilted squares and a 220 percale covering. A deep 15” pocket with full elastic around the bottom for an easy fit on plush mattresses. Free of chemical finishes and flame retardants, GOTS certified. 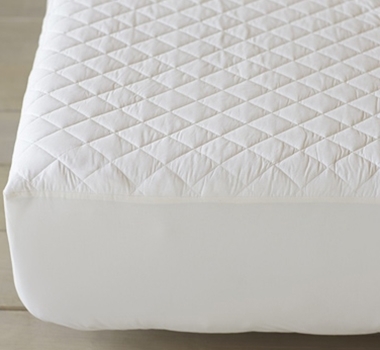 Tip from the experts: Never underestimate the value of a good Coyuchi mattress pad. It will extend the life of your mattress dramatically by helping to fend off spills, stains, sweat and skin oils. We recommend washing your mattress pad monthly. Available in Twin, Full, Queen, King and California King sizes. Organic cotton mattress pad is machine washable. We recommend using warm water, non-phosphate soap in the washing cycle, and a cool, no/low-heat tumble or line dry. The best way to dry, in our opinion, is to hang dry your Coyuchi products on a clothesline outside, capturing and bringing the magic of the outside back in. Wash with like items, wash whites and colors separately. For white fabrics, we suggest using non-chlorine bleach. Tumble dry low heat or line dry. The use of bleaching agents may diminish the brilliance and depth of the colors, so we recommend not using any whiteners. But if you must, please use a non-chlorine bleach.